Broadbent Stanley are an innovative company with a long manufacturing history supplying machine tools to the oil, gas and petrochemical sectors. We’re a first choice supplier for our Oil Country, Hollow Spindle Lathes and Yorky Type ‘O’ Oilfield Grinders. 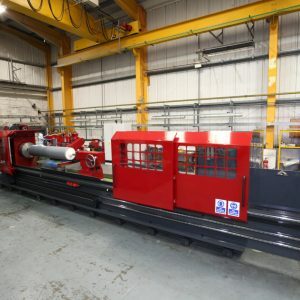 However, our product portfolio doesn’t stop there, as we also manufacture manual and CNC VTL’s, heavy duty bed and gantry mills along with vertical and horizontal machining centres and the Yorky Type ‘R’ Rubber Roll Grinder. 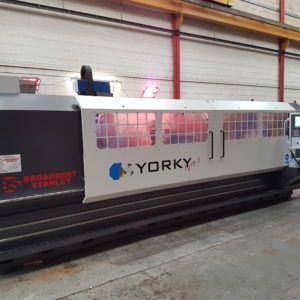 The Yorky Oilfield Grinder was designed to accommodate all types of oil tools including components up to 120″ as standard, with optional bed lengths giving up to 400″ between centres. Built to the same exacting standards as our heavy duty oil country lathes, the award winning Yorky is now a clear market leader. Similar in specification to our Oilfield Grinder, the model ‘R’ has been designed for the manufacture of large rubber coated rolls. It’s capabilities include plain and taper grinding, convex and concave shapes and all types of grooving including radial and linear along with diamond and chevron patterns.